The Large Flush Hybrid-Fyre Wood Insert is the cleanest burning large wood fireplace insert in the world! This insert burns so clean that it produces a mere 0.58 grams of emissions per hour, while testing at over 80% efficiency. This model features Avalon's signature styling and a massive cast iron door with high quality ceramic glass to present a stunning fire viewing area. 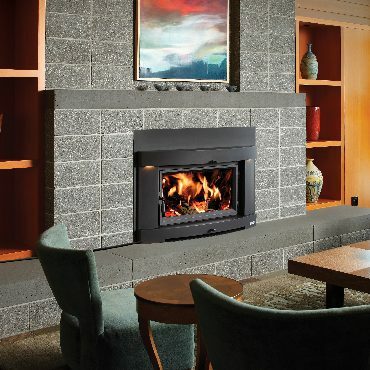 It is approved to fit large zero clearance and masonry fireplaces with its 19" depth and 3 cubic foot firebox. This insert is also capable of heating up to 2,500 square feet with impressive burn times of up to 12 hours, and standard concealed fans help circulate the warmth evenly throughout your home. The Large Flush Hybrid-Fyre is 20% more efficient than a typical wood fireplace insert, burning less wood, delivering more heat, and saving you money!